Opening night of the Alaska Republican party's convention was unorganized, 90 minutes behind schedule, and had its potential delegates running around the Captain Cook Hotel like a bunch of headless chickens. Delegates stood around for 90 minutes, some of them angry, with no guidance from party leaders. Lyda Green "I don't know what they're doing or where they are" when asked by a delegate what room she should go to for the opening reception. 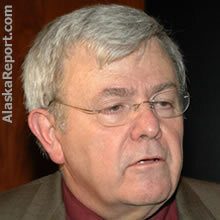 The big story of the night was the Chairman of Alaska's Republicans Randy Ruedrich. Is he a goner or not? After a week's worth of hype about an attempt to oust Ruedrich, a motion was made, and accepted, in a closed-door Central Committee meeting, headed by Ruedrich, to not allow the delegates to vote on whether to allow him to stay in office. When asked if he felt pressure to resign Ruedrich said "I have no intention of resigning"
"My intent is to serve out the term I was elected to unanimously by the people in Fairbanks. So I would be representing the party as the chair through the 2008 election when the term ends." "I plan to go on vacation," Ruedrich said. "Then I'll return to work the election. Our mission now is raise some candidates to make sure we don't give to any Democrats a free day in the sun." Nothing like the fox guarding the henhouse. Very true, so they do. Black sheep dwell in every fold ..."
"Vote for Change" buttons were on lapels throughout the hotel, except in the closed-door meeting where the actual decision was made. So much for change. Note to coup leaders - if you are going to have a coup, you can't let the dictator run the meeting. An anonymous spokesperson (for obvious reasons) told AlaskaReport, "Conservatives want our party back. We see a bright future, but only if we can cleanse the party and enact change." "At a time when we have the most popular governor in the nation, Ruedrich has failed to communicate with her," apparently since the 2006 election. Alaska governor Sarah Palin said she favors a change in leadership. The official Alaskan GOP website fails to include space for a positive mention of the governor, a picture of Palin, and celebrating the new administration's successes to date. No wonder conservatives feel it's time for Ruedrich to leave. They favor the vice chair, Kathy Gissel, stepping up to the chair because she has been uninvolved in the past problems and is highly respected as a hard worker. A recent non-scientific poll at KTUU.com found 88% saying that the GOP needs a change at the top. Joe Miller, a delegate leading the coalition was not available for comment, but has publicly stated that the Alaskan GOP needs a return to ethics, not corruption. Members of the coalition are working a balancing act, hoping that "the schools of fish will not follow the old school, and we can get a mass show of party courage." © AlaskaReport.com All Rights Reserved. AlaskaReport.com is a privately owned Alaska news, weather, and information website based in Anchorage, Alaska.